Oh… I love stand-up comedy! No. Comics like comic-books/comic-strips. Sequential art. Oh. I didn’t know they still made those things… Do you work on Superman/Spider-Man/Batman? No, comics as a medium has expanded steadily since the 1960s to encompass a wide-range of content like the medium of television/film/literature/painting does. Actually, you’d be surprised how many comics have important/shocking/moving content about anything and everything. Yeah. I exaggerate. But we’ve all had bits and pieces of that conversation at least once. I know I have. Multiple times. Sometimes with the same person… But that just might be because I’m constantly trying to have conversations about comics with everyone. I brought a reprint of “Amazing Spider-Man” #1 with me on my first day of a Shakespeare summer program in Milbrook Meadow, Rockport, Mass. when I was probably around twelve-years-old. I remember telling my father “I’m going to sit and read it during the lunch break, and maybe someone else who likes comics will notice me!” That practice is pretty nearly how I’ve pushed through every following stage of my life: Bring the comics, see who shows up. Make it as much fun as possible. Convince more people to show up next time. Repeat. Now I bring my comics on the subway and try to start conversations with my fellow passengers about my reading material. I want comics to be more visible, because that’s what the industry may lack most: visibility. I’ve written a great deal about that on The Long and Shortbox Of It. Ever since I took a week-long workshop class at the Center for Cartoon Studies in the summer of 2007, I realized how tremendously important it is to spend at least some time with a community of other people who ‘get’ it. 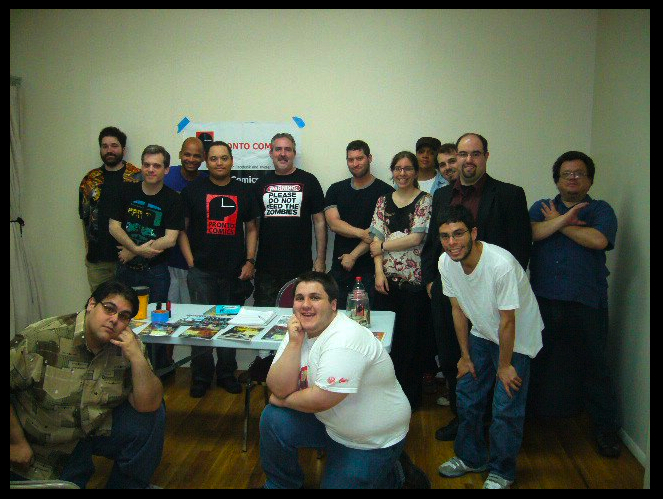 People who love comics and make comics. People like the people you’ll meet at a Pronto meeting. I discovered that it is absolutely invigorating for a comics creator such as myself. And so I try to make it happen as much as I can. Hopefully, slowly, we will together suceed in expanding our community so that the width and breadth of comics being produced is so enourmous that the width and breadth of comics readers expands with it, creating an even broader base of people with which to talk comics! Our fellow Pronto member Jesse Landau is looking for an artist to illustrate a 14 – 16 page story from his script about an otherworldly nomadic tribe abandoned by their God. Post in the comments section below or e-mail me at jonathangorga@yahoo.com to get in touch with Jesse. And remember that we are here to help you creators connect with one another!